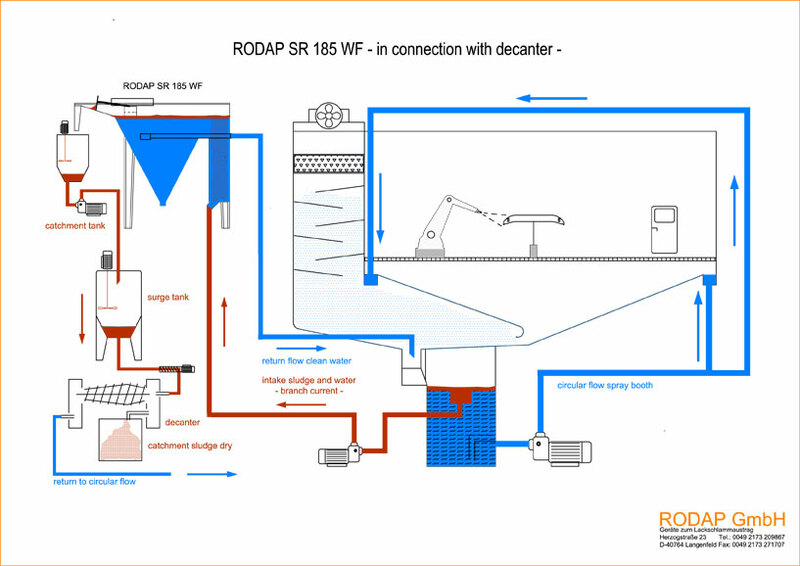 This automated sludge removal system is designed to work in conjunction with our high efficiency waterwash spray booths. The sludge removal system consists of a water treatment tank which is remote from the spraybooth. The system takes paint laden water to the sludge removal tank where a chemical interaction promotes paint material to float to the surface. It is then automatically scraped off to a special sludge holding receptacle for further dewatering, resulting in paint sludge waste with minimal water content. Clean, treated water returns to the spraybooth improving cleanliness and efficiency. The sludge removal system works with both solvent and water-based coatings and can be retrofitted to existing spraybooth systems. The system is fully automated, manufactured from stainless steel and allows continuous cleaning and recycling of the booth water. Can be close coupled to the spray booth or remotely mounted up to 50m from the spraybooth, meaning the 'dirty' sludge removal activity is remote from the 'clean' spraybooth operations. Don’t forget to view the full range of Junair Spraybooths industrial spray booth equipment .